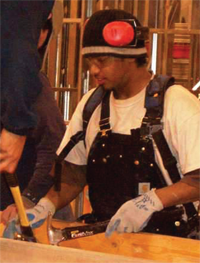 As it turns out Lawrence took to construction, and by the time he graduated from PYB in 2005 he had been accepted into a construction apprenticeship program through the NWCOC apprentices must work 8,000 hours to graduate from the program, which is the rough equivalent of working full time for four years. The graduation requirements breakdown into specific construction categories, such as finish work,framing, and concrete.Apprentices have the opportunity to work for various employers to meet their requirements.Since graduating from PYB, Lawrence has worked at two different companies, and is currently working for Cedar Mill Construction Company on a remodel of the Justice Center in downtown Portland. Lawrence has his future staked out. 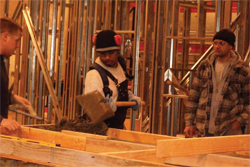 “I will be a carpenter for a couple of years until I finish college, but then my goal is to be a structural engineer. I like putting stuff together. Through this apprenticeship program I am getting a better concept of how things work, versus someone who just reads a textbook and doesn’t work in the field.” “My school is paid for because my company reimburses me after I get my grades. I am working, I have benefits, I get a raise every 1,000 hours of work—what more can you ask for?” Originally published in the Portland Youth Builders 2006Program Report. For more information on PYB, visit www.pybpdx.org. For more information on the Northwest College of Construction, visit www.nwcoc.com.